PL Medical Co., LLC offers x-ray mailing and filing envelopes specially packaged to meet our customers requirements. 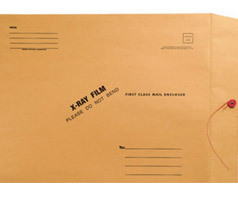 Our x-ray mailing envelopes protect x-rays from accidental damage during mailing. The mailing envelopes are made of extra heavy-duty Kraft paper and come with individual cardboard stiffeners. Designed to allow forth-class postage and/or first-class postage when a letter or report is included.